I have a few question, purely out of curiousity. How did you come up with the flag design? 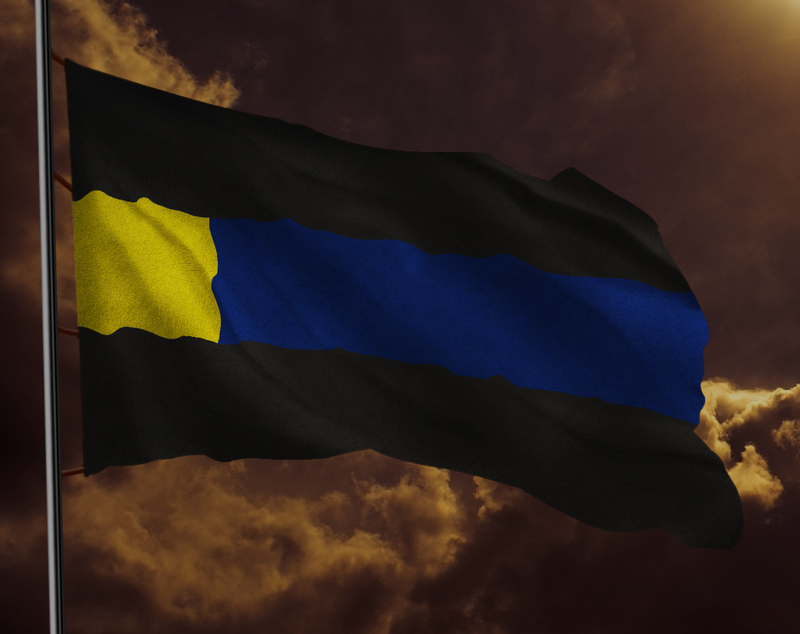 How did you make that flag design be implemented onto the realistic looking flag in your original post? Lordaeron was and in many ways still is Norse-themed. 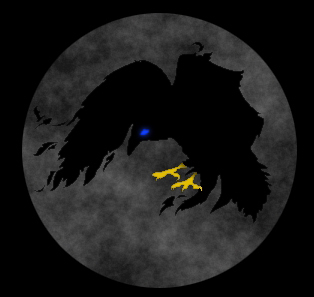 Our original symbol was therefore the raven, which is black, since that was a prominent symbol of the Norse. Since ethnic scandinavians almost exclusively have blue eyes, the raven was given that as well. I wanted the sun represented somehow due to its importance overall so the raven was given yellow claws. These three colors were later used in the unique tricolor flag pattern I came up with. Ahh, I see. Thank you for explaining. I'm putting the old first post here for archiving. The in-game faction name of our nation is Lordaeron. The official full name is the Empire of Lordaeron. The faction was founded 2012-06-23 as the City-State of Khanduras. Lordaeron is a constitutional empire. The laws in this post are considered our constitution and all members of Lordaeron, even the emperor, are limited by these laws. Our society is built upon a chain of command similar to how military organizations work. Kings are appointed by the emperor, dukes and counts are promoted from barons or stewards after recommendation by a king and approval of the emperor. Barons and stewards may be appointed by kings without having to consult the emperor. Abandoning a government job without permission from the permission above in the hierarchy means being banned from government jobs unless given a pardon by the emperor. The emperor always has absolute power over every decision in Lordaeron so that leaders who abuse their people or are incompetent can be stopped. The emperor's role is unique in that he leads the nation both at its broadest level and protects the common citizen from abuse by being the only person with the power to command anyone, even the kings. Additional duties of the emperor is to select new kings when needed and when a king chooses a new duke it must be approved by the emperor. The emperor may also enact special mod positions for individuals who stand outside the hierarchy but can provide benefits to the empire at least equal to those that a duke can. If the emperor can no longer fulfill his duties, a king chosen by the emperor as successor takes over. If during an emergency the emperor cannot be reached, at least two kings in agreement may make decisions in his stead. Below the emperor are the kings, and they are only held responsible to the emperor and no one else. Every king rules over a province and has full power over any duke, baron, citizen and villager of his province. A king may never interfere with another province without permission from the king of that province or the emperor. Kings are always mods of the faction. Dukes and counts are leaders of cities and have full powers over their city but not over anything else in the nation unless permission is given by the leader of that place or the emperor. Dukes report to the king of their province and the emperor and may be given certain restrictions like building style rules by their kings. Just like kings, dukes are always mods. Only one duke may be appointed per province. Counts are identical to dukes except that they have not yet been entrusted with mod powers. The lowest leaders are the barons and stewards. Barons rule the villages but are not mods and so are dependent on mods to give ownership to newcomers to their village. They always answer to the emperor, the king of their province and sometimes dukes of the province if that is what the king has decided. They have no right to interfere with other towns and may not demand that new land is claimed to their village unless the king of the province or the emperor has given permission for this. Stewards are like barons in every regard except that they serve a duke or king as an assistant in their city. Common citizens and villagers have to request ownership from a baron, duke or king in order to get a home or land to build on in the nation. They may move to another town as they wish, so that they are not forced to stay in a poorly managed town. Provinces are required to have exactly 2 cities. The king of a province always also rules one of the cities and this city will be province capital. If the king goes inactive or is fired by the emperor, the duke of the other city will become the new king of the province. If a province has more claims than power, the emperor can be expected to intervene and take any measures necessary to solve the situation. If the province does not have at least 25% more power than land the emperor will demand that the king takes action to remedy the situation. Less power than land will lead to direct intervention in the form of unclaimings and possible disbandment of the least power-efficient town in the province and a serious warning to the king. With 25% less power than land the least power-efficient town in the province will be immediately and completely unclaimed, the king fired immediately and replaced by a duke of the province or if none exists by direct rule of the emperor. A city is always ruled by a mod and always has more claims than any village and often multiple inhabitants. A village normally has 10-15 claims and should be lead by a baron with at least twice this power since villages are often only inhabited by their baron. The word town is used when referring to cities and villages in general. The capital city of the empire is not part of any province but is independent. All kings and dukes have the right to place people in free houses designated by the emperor in the imperial capital. Titles for leaders are with few exceptions Titlename-of-Townorprovincename. The emperor is Emperor-of-Lordaeron. A king is King-of-Provincename. A duke is Duke-of-Cityname. A baron is Baron-of-Villagename. Commoners have a different title setup, Townname-Titlename. The title name may be chosen freely by the ruler of the town, the king of the province or the emperor. If the commoner has not done anything exceptional, give him the title name Citizen or Villager depending on if the town is a city or village. It is important that all commoners are given these titles so that we immediately know what town they live in when they ask for our help and for calculating the power of a town. Lordaeron foreign policy is dictated by the emperor. Mods do not have the right to ally other factions and only have the right to enemy other factions if it is to drive off factions that are invading our lands. Foreign factions making claims in our lands is unacceptable unless a special temporary permission has been given by the emperor. If the foreign faction does not leave willingly after having been warned, they will be considered an invader and will be enemied and forced out. What type of buildings, building themes and so on that are allowed in a town is ultimately decided by the king of the province the town is in and the king may decide to delegate the power to his dukes or barons. There are however a number of imperial building laws that must be followed and are listed in the following paragraphs. In addition to these it is forbidden to have any kind of unclaimed buildings or ruins in a province since these tend to become inhabited by raiders. The king of the province is responsible that the province complies with these laws. All towns must have at least one imperial flag in them. The design of this flag is decided by the emperor. Cities must have at least two, and the capital at least four. Towns have the right to have a provincial flag designated by the king of the province. On flagpoles with multiple flags, the imperial flag must always be on top. The nether tunnel network known as the webway is the empire's primary transportation system. This is because it lets us travel to any connected town at a speed 8 times faster than running in overworld in complete safety. Therefore all cities must be connected to the webway. Since villages are usually more temporary, they are not required to have a webway connection but it is recommended for those villages that are likely to be permanent. The king of the province is responsible for ensuring that these requirements are met. All towns on the mainland within a reasonable distance of other towns are also required to have some sort of overworld road or other transportation system to nearby imperial towns. Experience shows that raiders rarely bother griefing stone roads in the wilderness since they are more difficult to remove than place, so this is recommended as an inexpensive and power-free type of road. The type of road materials to be used in a province are decided by its king. Towns that are mostly underground are strictly banned since they have historically proven to in every case turn into failures to varying degrees. Damn Roob u so mean! 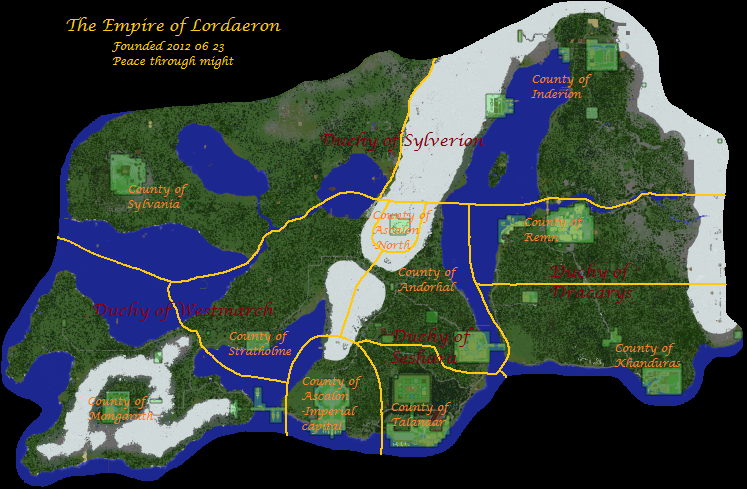 Lordaeron is as of today a representative democracy but remains also a constitutional empire. 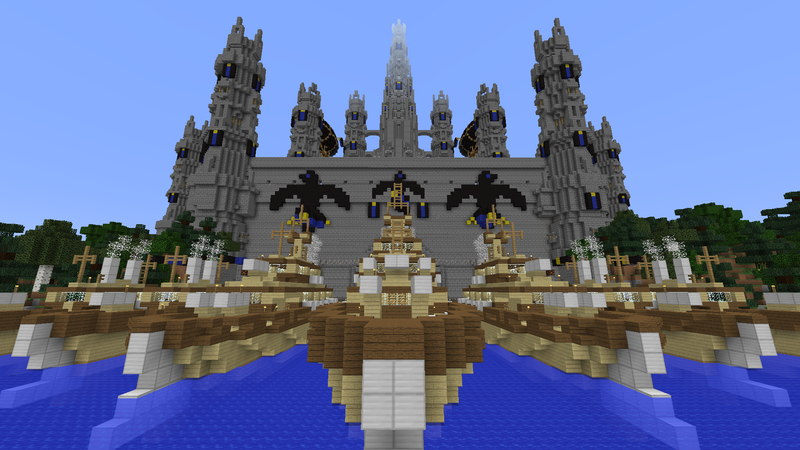 We the first known representative democracy on the server. Lordaeron is as of today a representative democracy but remains also a constitutional empire. Long live the democratic empire! Election for Chancellor begins Thuesday 2015-01-13 19:15 server time and ends Thuesday 2015-01-20 19:15 server time. Members of Lordaeron must give me their vote here during that time and may be given to me here in the thread, in-game using the chat or /mail or on Skype. I will announce the candidates here as they declare their candidature. The candidates so far are robbinho15, walle01 and Bogdanus. Are allied faction allowed to submit an faction whole vote?